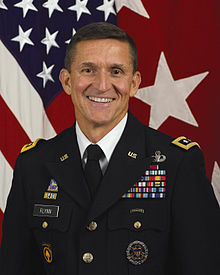 Ogden on Politics: More Flynn Foreign Payments Revealed; Trump-Friendly National Enquirer Labels Flynn a "Russian Spy"
More Flynn Foreign Payments Revealed; Trump-Friendly National Enquirer Labels Flynn a "Russian Spy"
A few weeks ago it was revealed that General Michael T. Flynn, who advised President Trump on foreign policy, and briefly served as National Security Adviser in the Trump administration, was acting as an agent of of a foreign government, namely Turkey. Flynn's company received $530,000 for 90 days of work to investigate and undermine a political opponent of Turkish President Recep Tayyip Erdogan who engaged in a political crackdown after surviving a military coup. the country with the Donald Trump campaign. It's a good gig if you can get it. But it turns out, there were more payments. Recently, Flynn amended federal disclosure documents to show payments from Russian outfits, i.e. Volga-Dnepr Airlines and Kapersky Government Security Solutions, Inc, each of which paid him $11,250. Flynn was also paid $45,000 by RT, the state Russian news agency, for a speech he gave in 2015, another payment he failed to disclose. Jason Chaffetz (R-Utah), chairman of the House Oversight and Government Reform Committee, indicated the payments might result in a referral to the General Accounting Office, which might ask for a return of all the money. As Rep. Chaffetz notes, former military officers simply are not allowed to take these type of payments. It is not a stretch to think there might be criminal liability involved with the payments, which might further explain why Flynn is requesting immunity for his testimony. National Enquirer's CEO David Pecker is a good friend of President Trump. Pecker's publication has enthusiastically supported his campaign for President. During various points in the campaign, the National Enquirer published scandalous (and unverified) stories about Trump's opponents which Trump then used on the campaign stump. These National Enquirer stories includes the bizarre piece claiming that Sen. Ted Cruz's father was involved in the plot to assassinate President Kennedy. Despite the absurd stories that regularly appear in the magazine, President Trump has on several occasions said the Enquirer is a credible source of information.. While the Enquirer has zero credibility as a news source, the story calling Flynn a Russian spy is noteworthy for this reason: The story almost certainly didn't go to print with Trump's direct or indirect blessing. The story represents the beginning of the new spin that Trump wasn't personally complicit with Russian meddling in the campaign, that he was instead a victim from unscrupulous Russian agents like Flynn. General Flynn take a look at the Trump bus. You're going to soon find yourself underneath it.